A traditional Tea Room located in a listed Georgian building overlooking Richmond's historic cobbled market place. A regular menu of delicious, freshly prepared main meals is supplemented with a range of daily, main course specials and fresh baking all prepared on the premises. 38/39 Market Place, Richmond, North Yorkshire. The iconic 91 bedroom Scotch Corner hotel, fully refurbished in 2011 costing over £3.5 Million. The hotel boasts conference facilities for up to 300, a Fratello's Italian restaurant and a full service leisure facility; Active Life Leisure Club. We have a seasonal menu with strong rustic flavours combined with the a level of quality you would expect today. Our aim is to provide delicious food in a beautiful location, and hope that once you have come once, you will want to come back for more time and again. New Treasure Garden is a traditional Chinese restaurant with a relaxed and informal oriental atmosphere. The restaurant is fully licensed with a large selection of wines from around the world and a bar with a wide variety of alcoholic and non-alcoholic beverages. Our menu is predominantly focused on traditional Cantonese cuisine and includes a large choice of vegetarian dishes. The restaurant is open Sunday to Thursday 6pm – 11pm. Friday and Saturday 6pm – 11.30pm. Closed on Tuesdays. Take Away menu also available. The Scone Bar is an Edwardian Tea Room: a dining experience for 'sconnoiseurs', and all discerning food lovers, inspired by the Edwardian era, during which time taking afternoon tea - or coffee, from a pot - was the height of fashion. You will be delighted with the selection of scones we have to offer: the old favourites of fruit, cheese and cherry, alongside more unusual choices, including chilli cheese, white chocolate & cranberry and bacon & pine nut, to name a few! We have daily 'specials', including delicious fillings of popcorn cream, toffee sauce and of course, jam and cream. There's also a selection of tasty quiches, with our house salad, potato salad and coleslaw, and warming soups, served with a cheese scone. We aim to provide a variety of vegetarian, diary free and gluten free options, for food and drink. We offer a take away / delivery service to local businesses; private and business functions also catered for. The Talbot Hotel is a traditional English real ale pub overlooking the historic, cobbled market square of Richmond. We offer an excellent selection of traditional pub food using only locally sourced meat and fresh vegetables. Open for lunch everyday from 12 - 3pm and Sunday lunches 12 - 4pm. From mid April onwards we serve evening a la carte and bar meals from 5 - 8.30pm. 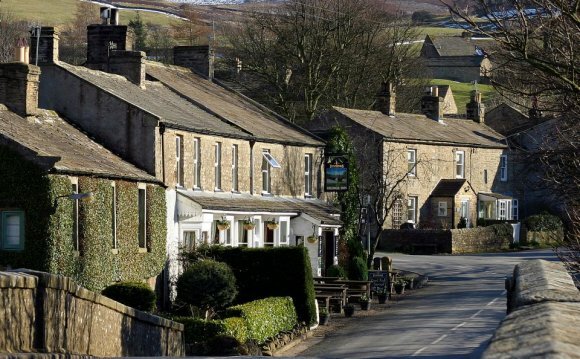 The Wensleydale Heifer offers high quality award winning dining. We offer two alternative dining experiences, The Seafood Restaurant and The Fish Bar. The proof of the pudding really is in the eating, so why not come and check us out, and if you want to dine and stay, you could try one of our award winning rooms. We like to let our guests do the talking.. "the best place to eat in Yorkshire, where service and food quality is second to none.."